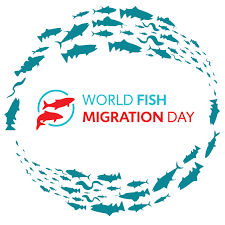 The World Fish Migration Day (WFMD) is a one day global celebration to create awareness on the importance of open rivers and migratory fish and it is coordinated by the World Fish Migration Foundation. On World Fish Migration Day organizations from around the world organize their own event around the common theme of: CONNECTING FISH, RIVERS AND PEOPLE. Many of these events are open to the public. By working together we create a greater driving force to raise awareness, share ideas and secure commitments.